As the middle class shrinks and real wages have been steadily decreasing, the economic lives of low- and middle-income families in the United States have been getting more precarious and difficult. The Economic Policy Institute reported that real wages for low-income workers have decreased 5 percent from 1979 to 2013. And according to a recent report by the Pew Research Center, middle-income Americans are no longer the majority—the first time this has happened since 1971. To make ends meet, many have turned to the “on-demand” economy. The on-demand economy provides workers with supplemental income, which many desperately need. It also in theory allows workers the flexibility to set their own work schedules. As a result, the on-demand economy is expected to grow significantly. According to Intuit, the on-demand labor market will increase by 18.5 percent over the next five years. An analysis by the Bay Area Economic Institute showed that the number of annual filings of Form 1099, the form used to report contractor income, has increased by 40 percent since 1989, with a considerable spike since 2009. The on-demand economy can provide either full-time or supplemental employment, so it is important to understand what role it plays in its participants’ financial lives. In a study conducted by Common Cents (a financial decision-making research lab funded by MetLife Foundation) and Payable (a platform for contractor payments, benefits and tax tools), more than 64 percent of participants were contracting part-time. This suggests that such workers contract as a means to supplement existing income. With these facts in mind, it is important to ask to what extent American households will actually benefit from the on-demand economy. Do 1099 jobs provide “flexible” hours? Unlike traditional employees, independent contractors can often choose their work hours. They decide how long and when to work. However, while the on-demand economy is still relatively underresearched, a 2015 report by Request for Startups suggested that contractors’ working hours might not be as flexible as assumed. When this report analyzed ride-sharing contractors, it found that the top factor influencing work schedules was “demand” and not “supply,” suggesting that these contractors worked not when they wanted to, but when there was demand from passengers. More importantly, these ride-sharing contractors reported working different hours and longer hours than their ideal work schedule. Do 1099 jobs provide a meaningful increase in income? Aside from working less-than-ideal schedules, many contractors might not be earning enough. In the Common Cents study with Payable, full-time independent contractors self-report a median income of just $20,000 a year. This level of income is far below the U.S. median personal income of $28,851. And the picture is of course very different for those who were part-time contractors. Their median annual contracting income was $6,000. Along with lower income, the study found very high levels of income volatility. Contractors reported that their income could vary by a factor of 10 from one month to the next. Imagine how difficult it would be for anyone with such large income swings to budget for expenses or effectively manage their financial life. To add to this complexity, taxes from contracting income are not automatically withheld. Independent contractors have to track their tax liabilities accurately and take the initiative to set aside part of their earnings in anticipation of April 15th. On top of that, workers who earn more than $3,000 in contracting income should pay quarterly taxes. 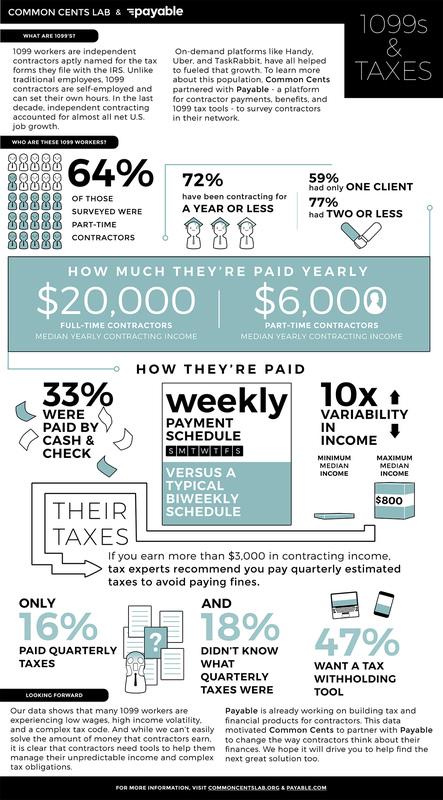 Yet the Common Cents/Payable study found that only 16 percent of contractors filed quarterly taxes. Eighteen percent did not even know what quarterly taxes were, let alone pay them. The tax-withholding issue, at least, appears to be among the more addressable problems created by the complexities of the on-demand economy. In one study, Payable found that more than 47 percent of participants expressed interest in a tax-withholding tool, which allows contractors to automatically withhold a portion of income and set it aside for taxes. 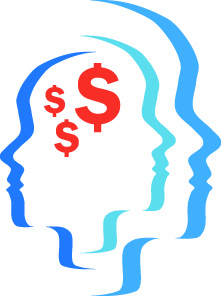 But many of the other financial challenges associated with contract labor remain more difficult to tackle. In short, with its tax-reporting burdens, income streams that are both low and also very erratic, and unpredictable and potentially difficult working hours, it is clear that contracting work may not be the panacea for the struggling middle class. It is also clear that as the on-demand economy grows, there will be a corresponding growth in demand for financial tools that can help people navigate its complexities.